The Chippewa proudly referred to themselves as Anishinabe meaning “The Original People.” The Turtle Mountain Band of Chippewa is primarily members of the Pembina Band of Chippewa. Descendence may include intermarriage with other Chippewa bands, Cree, and other nations who make up the membership of the Turtle Mountain Band. The name Chippewa, a mispronunciation of Ojibwa, Ojibway, Ojibwe, Saulteaux, and Anishinabe are all names that refer to the same group of people. The word “Ojibwa” refers to “something puckered up.” One theory is that it comes from the way in which the people made their moccasins. For the purpose of this discussion, the term “Ojibway” is used when referring to the tribe’s early history. 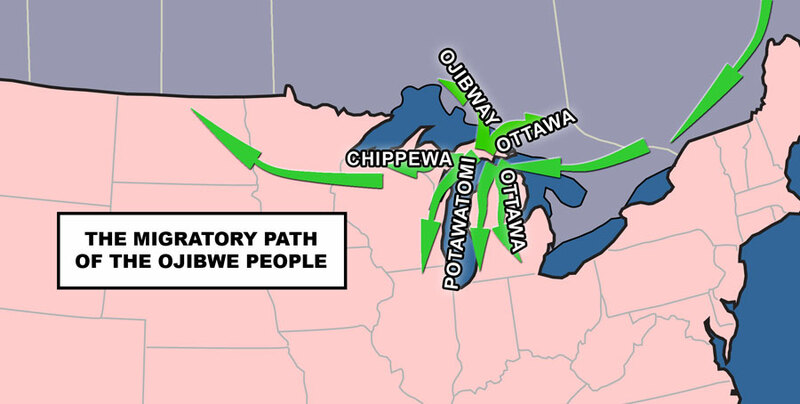 The term “Chippewa” is used after European contact. The Ojibway are members of the Algonquin language group which are located from Newfoundland to the Rocky Mountains and from Hudson Bay to North Carolina. Other tribes in this language group are the Cree, Ottawa, Sauk, Fox, Menominee, Potawatomi, Miami, Shawnee, Delaware, Cheyenne, Blackfeet, and the Arapaho. This classification by language has been established by scholars, but this does not mean that the tribes are closely related or that they were allies. The Ojibway of this continent have their own creation story. The following creation story has been recorded on birch bark scrolls and passed down orally through generations. The Ojibway believe they have always lived in North America. It was during the winter season that elders recounted tribal stories and events. The Ojibway describe their beginning in the following creation story. When Ah-ki’ (the Earth) was young, it was said that the Earth had a family. Nee-ba-gee’sis (the moon) is called Grandmother, and Gee’-sis (the Sun) is called Grandfather. The Creator of this family is Kitchie Man-i-to’ (Great Mystery or Creator). The Earth is said to be a woman. In this way it is understood that a woman preceded man on Earth. Long ago, Kitchi Manitou had a dream. He saw the sky filled with the sun, earth, moon and stars. He saw the earth covered with mountains and valleys, lakes and islands, prairies and forests. He saw trees, flowers, grass and fruit. He saw all manner of beings walking, flying, crawling and swimming. He saw birth, growth, and death. And he saw some things that lived forever. Kitchi Manitou heard songs and stories, he touched wind and rain, and he experienced every emotion. After his dream, Kitchi Manitou made rock, water, fire, and wind. Into each he breathed life and to each he gave a different essence and nature. From these four elements Kitchi Manitou created the stars, sun, moon, and earth. Kitchi Manitou gave special powers to all of his creations. To the sun he gave the power of light and heat. To the earth he gave growth and healing. To the water he gave the power to purify and renew. And to the wind, he gave the voice of music and the breath of life. ...Kitchi Manitou then took four parts of Mother Earth and blew into them using a Sacred Shell from the union of the Four Sacred Elements and his breath, man was created. Man, as the last of Kitchi Manitou’s creation, regarded plants, animals, and all of creation as elders because those life forms were created first. Stories were always a way of teaching. The following legend refers to the Ojibway’s oral legend of the great flood. Many tribes have stories which include a “spirit or trickster” character. This character’s role was to explain and teach lessons of value. Nanabozoho is a spirit character of Ojibway legends. While our forefathers were living on the great salt water toward the rising sun, the great Megis (Sea Shell) showed itself above the surface of the great water, and the rays of the sun for some long periods were reflected from its glossy back. It gave warmth and light to the An-ish-in-aub-ag (red race). The “Megis” he spoke of referred to the Me-da-we religion. According to the leader, each time the Me-da-we lodge was erected it was indicated as the “Megis” in the story. The final lodge [in this narrative] was erected on the Island of LaPointe. This is where the Me-da-we-win was practiced in its purest form. It remained so until the Europeans appeared among them. It is from this site that all of the Ojibway tribe first grew, and like a tree it has spread its branches in every direction, in the bands that now occupy the vast extent of the Ojibway earth. The Ojibway migrated in many directions. They lived on the eastern shores of Turtle Island (North America) around 900 A.D. and eventually established their aboriginal territory in the woodlands of Canada, Michigan, Minnesota, Wisconsin, and eventually North Dakota and Montana. Around the beginning of the 17th Century or shortly thereafter, the Ojibway moved westward to the shore of Lake Superior. This migration was taking place on both the north and south shores of Lake Superior. The tribes that were to the north of the lake were mainly Ojibway and Cree with whom they shared familial ties. The Ojibways to the south of the lake were called “Chippewa”—an English mispronunciation of Ojibway. The shores of Lake Superior were vastly populated by the Ojibway when the Jesuits and French traders recorded contact in 1640. An Ojibway chief by the name of Copway stated first contact with Champlain traders occurred as early as 1610. Ongoing contact with the French missionaries and French traders during the 17th and 18th centuries had an enormous impact on the lifestyle of the Ojibway. Early settlement brought them in proximity to the Assiniboine and Cree, and in conflict with the Dakota over territory, as they moved into the location that is present-day northern Minnesota. Very early the Ojibway were involved in trade, first among other Ojibway bands, and later with the fur traders. The tools that the French traded consisted of such things as steel knives and copper kettles. The efficient tools of the French were easily adapted by the Ojibway. The previously used stone and bone utensils became necessary items. The acceptance of the French fur trader had a social and psychological impact on the culture of the Ojibway. The Ojibway had always hunted and trapped for survival. They also traded among other tribes before Europeans. Originally, the Ojibway were middlemen for the Mandan, Hidatsa, and other tribes who bartered with the fur traders. As resources became scarce, the Ojibway were forced to adopt trading furs for goods to survive. The fur trade deepened the relationships between the Ojibway and Cree, and French traders, resulting in marriages between them. These associations were based on a sharing of economic, social, and physical resources. The first generations of offspring of these marriages were raised as their mothers’ people. In time, some of the children of the Frenchmen and their Ojibway and Cree wives became known as “Métis” or “Metchif.” Contact between the French, the Europeans, and their Woodland relatives brought about many alliances during the fur trade era. These people retained many of their tribal customs. As the fur trade flourished in the first half of the 17th century, the Ojibway played a central role in its development. In 1670, the English Hudson Bay Company set up posts and obtained furs directly from the Indians who had an established trade system in the Great Lakes region. The English were in competition with the French fur trade companies, who had trapped and traded with the Indians from as early as 1610. This competition was over the Indian trade in the Hudson Bay and the Great Lakes and their tributaries. A “head on” confrontation between these two countries was fueled by a swiftly diminishing supply of furs, resulting in a conflict known as the French and Indian War. In 1763, the English gained control of the fur trade both in Canada and the Great Lakes area. As the Hudson Bay Company assumed many of the older French trading posts, new settlements came into existence. Grand Portage (the great carrying place), a well known trading center, came into existence. All trading goods going east or west had to be portaged (carried) over rugged steep trails from Lake Superior to reach the chain of lakes along the northern border of Minnesota. In the summer, traders and Indians all gathered at Grand Portage to barter their goods. In order to withstand the rigors of portaging goods over land and along the waterways, a group of skilled oarsmen evolved, known as the “voyageurs.” The voyageurs were French Canadian, Cree, and Ojibway canoe men who became a critical link in the success of the North American fur trade. The voyageurs portaged through the wilderness of rivers, lakes, and seaways in the Northwest Territory. Their appearance was colorful. They wore bright red caps, hooded cloaks, braided sashes, and beaded pouches. Their leggings and moccasins were made of deer hides. They were known as cheerful men capable of great endurance and physical strength. 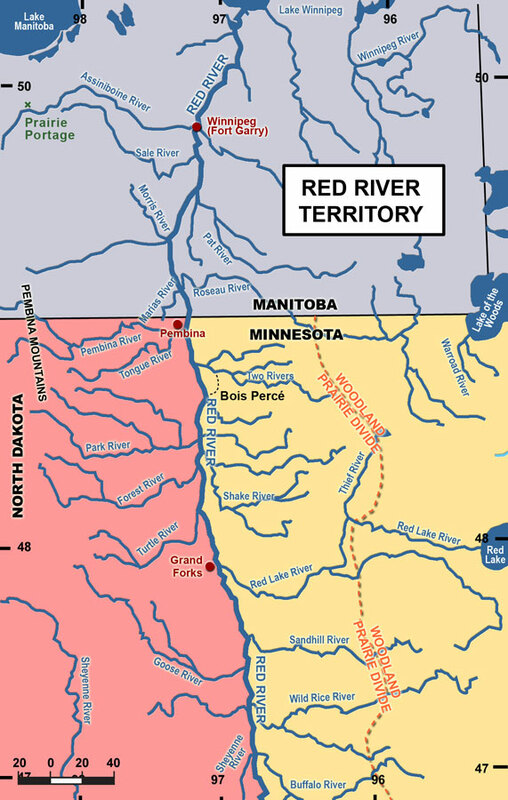 The Red River became an arterial of travel for the trappers at the end of the 18th century. Trapping was done along the Assiniboine and Red Rivers and all their tributaries. The establishment of trading posts transformed the Red River into a commercial trade economy, to which many Chippewas were accustomed. The Chippewa occupied the territory of northern Minnesota, from Red Lake, Leech Lake, Sandy Lake, Lake of the Woods and Rainy Lake to Lake Superior and Lake Winnipeg Traverse. The regions around these lakes became their more permanent settlements. During the hunting/trapping season, the men canoed the Red and Assiniboine Rivers and a vast number of tributaries. The numerous trading posts along the Red River assisted in the growth of fur trade and westward movement. A second post at Pembina was opened three years later by a man named Alexander Henry. He operated the post at this site from 1801–1805, and recorded his dealings. He also set up many sub-posts along the Red River, depending on the supply of furs in each area. The post was the focal point of trade in the middle Red River region. Pembina became the chief North West Company trading post along the Red and Assiniboine Rivers. The number of Chippewas who traded in the area increased each year, but the supply of fur was rapidly diminishing. The transition of the Chippewa from the woodlands to the plains occurred near the end of the 18th century. French and English fur traders had traveled with the Chippewa as far as the Turtle Mountains. Having acquired guns and ammunition from the traders, and horses from the Mandan and Hidatsa, the Chippewa had an advantage in obtaining territory in Dakota. They had spent a decade utilizing the rivers of the Red River Territory. However, by 1807 this region was virtually depleted of wild game and furred animals. Feeling the hard times, these bands returned to their woodland homes in Minnesota. One group, the Mikinak-wastsha-anishinabe, a band of Chippewa, left the Pembina settlement and established themselves in the Turtle Mountains. The Pembina Band of Chippewa advanced westward for several reasons. First they had acquired the horse and developed the Red River Cart. Alexander Henry (Younger) stated in his Journals that one cart was as useful as five horses. The Turtle Mountains were plentiful in resources. Abundant in muskrat, beaver, fish, deer, and buffalo, the Turtle Mountains allowed the Chippewa to maintain a thriving fur trade. This region was filled with lakes and water resources as well as several types of medicinal and edible plants. At the same time, the Turtle Mountains offered a refuge from the encroachment of white settlers. Although they moved to the plains, the Chippewa still traded at the posts in Pembina, as well as trading with the Mandans and other tribes at Fort Union. The ox-drawn Red River Cart was first introduced to the plains from Pembina around 1805. Within a few decades there were great trains of these carts, carrying buffalo hides and other trade goods to St. Paul, Minnesota and Winnipeg, Canada. These famous carts were also widely used on buffalo hunts. 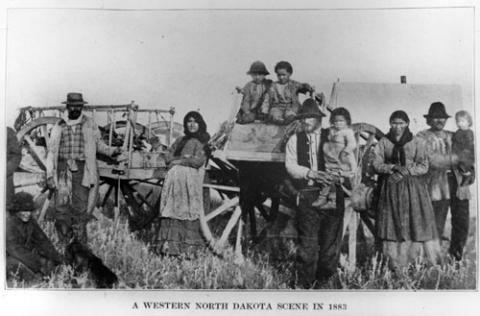 Red River Carts gave the Chippewa and their Assiniboine and Cree allies a method of transporting huge amounts of pemmican and hides for trade, and hunting in massive groups. The Chippewa first established themselves at Pembina in the early 1800s. They had in their company a resident Canadian priest. They built a church and many marriages and baptisms were recorded at this mission site. In 1849, this priest, Father Belcourt, through correspondence, interceded on behalf of the people. He informed Major Woods of the trade dealings of Hudson Bay Company. Although it was forbidden to trade alcohol, Father George A. Belcourt was aware that during the previous year, one-fifth of all imports from the Hudson Bay Company consisted of rum. The priest categorized the people. Taking the posts of Red Lake, Reed Lake, Pembina, and Turtle Mountain into consideration, the priest believed there was a total of 2,400 Chippewas. He went on to comment that the Métis (French word meaning mixed-blood) were greater in numbers than the Chippewa. The priest believed there were more than 5,000 Métis in the Pembina Territory. Included in his letter to Major Wood, Father Belcourt suggested that possibly the United States government could be the middleman for a treaty between the Chippewa and Dakota. He suggested the government declare imprisonment or other punishment for Indians committing hostilities against each other. Commencing at the mouth of the river Wahtab, thence ascending its course and running through Lake Wahtab: from thence taking a westerly course and passing through the fork of the Sauk River: thence running in a northerly direction through Otter Tail Lake and striking the Red River at the mouth of Buffalo River: thence following the course of the Red River down to the mouth of Goose River: thence ascending the course of Goose River up to its source: after leaving the Lake, continuing its western course to Maison au Chine: from thence taking a northwesterly direction to its terminus at a point on the Missouri River within gunshot sound of Little River. In the treaty between the Chippewa and Dakota, they agreed to abide by the boundaries, as well as allowing each other, in a neighborly manner, to hunt on each others land if game was scarce on either side. They also agreed that depredations by members of each tribe, such as stealing horses, needed to be dealt with, either by return of property, or repayment for damages. These articles were agreed upon 33 years earlier by the forefathers of these two tribes, Chief Waanatan (He Who Rushes On) for the Dakota, and Chief Emay das kah (Flat Mouth) for the Chippewa. To bind the treaty, oral history states that there was an exchange of tribal members. “We will not make war against our grandchildren” was a statement made by the treaty signers. The United States government and settlers wanted to prove that the Chippewa did not hold aboriginal claim to the land that was intended to become their reservation. A Grand Council meeting was held between the Chippewa and Dakota at a point north of the Sheyenne River and west of Devils Lake in July of 1858. Chiefs involved in the signing of this treaty were Mattonwakan, Chief of the Yanktons, and La Terre Qui Purle, Chief of the Sisseton Band. Also signing was a large representation of braves and warriors of the Dakota Tribes. Representing the Chippewa was Chief Wilkie known as Narbexxa who was a well-respected follower of Little Shell. Based on the documentation from the Sweet Corn Treaty, the Chippewa were able to claim 11 million acres of land that the government wanted for a public domain. The land described in the Sweet Corn Treaty was used later by the government and provided supportive documentation of Chippewa title in the Old Crossing Treaty and even later the McCumber Agreement. By 1863 the Chippewa occupied over one-third of what is now the State of North Dakota, including the Red River Valley. With the American philosophy of manifest destiny and the Homestead Act, settlers petitioned Washington to pressure government officials to make treaties with the Indians who had the rights to the land. The settlers recognized that the Red River Valley was a rich and fertile agricultural area. On October 2, 1863, at the Old Crossing of the Red Lake River in Minnesota, the Chippewa Chiefs, headmen, and warriors of the Red Lake and Pembina Bands met with Alexander Ramsey and Ashley C. Morrill, Commissioners for the United States government. The purpose of the meeting was to obtain Chippewa land through the treaty process. The Chippewas were represented by the chiefs of Red Lake and Pembina. The Red Lake chiefs were: Monsomo (Moose Dung), Kaw-was-ke-ne-kay (Broken Arm), May-dwa-gum-on-ind (He That is Spoken To), and Leading Feather. The Chiefs of the Pembina Band were Ase-anse (Little Shell II) and Miscomukquah (Red Bear). After the Chippewa ceded the Red River Territory in the 1863 Old Crossing Treaty, the land to the south of the 49th parallel was opened as public domain lands. The Métis to the north of the boundary were being denied their land holdings on ancestral lands by the government of Canada. For more than fifty years, the Canadian Métis had made this northern territory their home. They had developed small river front settlements and began to use the land for agricultural purposes to supplement their livelihood. Prior to this time, many Métis had settled south of the international boundary line. In 1823, when Major Stephen H. Long surveyed the international boundary, he established that Pembina was in United States territory. The Métis had settled in Pembina because of its proximity to the trade routes, and the relationships they had established at the Pembina trading post. The Hudson Bay Company, on the other hand, was within the Canadian boundary. Because the Métis relied on the Hudson Bay Company as their market for trade goods, the Company was able to coerce many Métis traders to move north across the international boundary into Canadian jurisdiction. In 1865, the Métis were discontent. The Red River Métis were aware their land holdings were in jeopardy. The Canadian government would not listen to their grievances. No longer satisfied, the Métis joined together, under the leadership of Louis Riel, Jr., and rebelled against the Dominion of Canada. Canada was in the process of becoming its own country. The Hudson Bay Company had just surrendered title to these lands. In addition, Canada, at this time, was legally without a government. Riel developed a “Bill of Rights” and he and his supporters formed a provisional government in November of 1869, to represent the Métis. Riel also developed a list of grievances that would benefit Canadian, English, American, and Indian people alike. The document provided for religious, cultural, language, and land rights. Riel, and his supporters, formally declared the establishment of a provisional government in November of 1869, and demanded rights as loyal citizens of the Crown. The situation got out of control for Riel and his followers. The provisional government took hostile locals as prisoners and one of them was executed. The opposing Canadian officials and the new Governor of Canada, commissioned troops and forced Riel and his armed followers to flee for their lives. Although the “Bill of Rights” Riel developed was implemented by the Canadian government and known as the Manitoba Act, Riel and his supporters were not granted amnesty for their actions. Louis Riel was exiled from the Canada for five years. Throughout the treaty era, the Indian people witnessed the inconsistent behavior of the United States government. They lived and witnessed the false hope of the Great White Father and were left with little or no land, and were poverty stricken. The trust between the Indians and the government had dissipated. The United States, following the civil war, could ill afford to continue treaty-making. As a result, the President established the Grants Peace Commission in 1868, and proposed a policy to make agreements with all of the tribal nations across the country. This policy was to bring about an end to the Indian wars on the plains, and to open the routes west for an ever-growing flood of emigrants. In 1871, Congress revised its policy of “treaty-making” and continued to negotiate, but called the process “agreements” rather than treaties. The era of making treaties was coming to an end. The first agreement to be made with the Pembina Band of Chippewa was the McCumber Agreement. The Chippewa occupied the east and north central parts of North Dakota, a favorite hunting and wintering ground. The hunting and trapping lifestyle of the Chippewa kept them moving throughout the year. During their absence settlers began to occupy Chippewa lands. There were requests from settlers to remove the Indians from North Dakota. Politicians even refused to credit the Chippewa for their aboriginal title to the lands. The government attempted to move the Turtle Mountain Chippewa to White Earth in Minnesota, but because of the provisions in the Sweet Corn Treaty with the Dakota, the Chippewa claim remained valid. It is here forbidden to any white man to encroach upon this Indian land by settling upon it before a treaty being made with the American government. Little Shell’s warning caused settlers to petition the government to open lands claimed by the Turtle Mountain Chippewa. By October of 1882, the Secretary of the Interior had opened up lands for settlement without negotiating with the Chippewa. When the government put the lands of the Turtle Mountain Band of Chippewa into the public domain and began to issue homesteads to white settlers, a delegation of tribal members went to Washington. Their task was to petition the government and be recognized to their right to nearly 10 million acres of land in North Dakota. One of the provisions of the McCumber Agreement required a census to be taken. McCumber’s agent reported small numbers (about 25 full-blood families) were living in the Turtle Mountain areas. Because of the way the rolls were taken, many were not fairly represented. Little Shell and his followers were excluded from the rolls, leaving a total of 520 people stricken from the rolls. Little Shell and Red Thunder protested this action. Many of the people who were removed from the roll moved to Montana. The meetings were held at the agency storehouse, which was inadequate in size. After Agent Waugh and his group were inside only enough room was left for about one-fourth of the tribe to be present. Those that were present were obstructed by partitions and supplies. As a result, the proceedings were difficult to hear or understand. Upon their arrival at the meeting, Little Shell and his council were informed they were not invited and their people would not be fed. Waugh apologized to the commission saying that the Indians misunderstood his letter to them. However, his letter, in fact, stated the commission would be at the agency to meet with them. Little Shell and his followers were turned away, and told that if they had anything to do, they had better do it. Little Shell left the meeting. John B. Bottineau, attorney for the Turtle Mountain Band, reported to Little Shell the action of the Commission regarding enrollment. The commission turned away many members of the band who were starving. Many desolate, starving people returned home. In spite of their pitiful condition, they took a collection amongst themselves to allow Little Shell and his council to represent them at the proceedings. The Commission justified not feeding the people by stating that the Chippewa misunderstood Major Waugh’s letter and he would only feed those selected by the United States government. The Committee suggested that Little Shell stay and help with the rolls. However, Little Shell and his followers left, designating attorney Bottineau to act in their behalf. Bottineau, realizing a great injustice had been done concerning the rolls, requested the commission to give him a list of those excluded from the list, to appeal for them. They never provided him the information. Instead, they hung a list of people rejected from the roll on the church doors on September 24, 1892. Bottineau then requested access to the rolls. 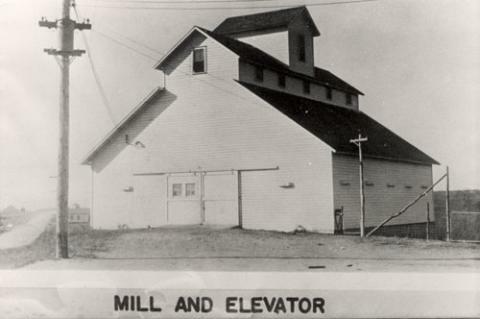 The commission agreed, but E. W. Brenner, Farmer in Charge, refused to provide access to Bottineau, only giving numbers of those eligible and numbers of those rejected. After a discussion between Little Shell, his council, Bottineau, and Judge Burke, it was decided they should leave. Waugh’s committee of thirty-two accepted the terms of the agreement. The tribe as a whole did not recognize this Committee. In customary fashion, the Chief appointed the council. Because they did not recognize the committee of thirty-two, they had no right to handle the affairs of the tribe. Upon conclusion of the meetings, the committee of thirty-two realized the grave mistake they had made and reported this to Little Shell. They knew what was taking place but offered no alternative to the situation. On October 24, 1892, Chief Little Shell and his councilmen filed a protest with Congress against the ratification of the proposed McCumber Agreement. With the assistance of Bottineau, J.B. Ledeqult, special interpreter, and Judge John Burke, the protest outlined the grievances of the Turtle Mountain people. They disagreed with the government’s negotiations with the committee of thirty-two, who were not the recognized Grand Council of the Band. They also protested to the inappropriate conditions of the meeting place, and the threats by Agent Waugh of removing them from their lands. The payment of the settlement was also considered inadequate. It discriminated against the Chippewa. Other treaties and tribes were getting anywhere from .50 cents to $2.50 per acre. In addition, non-Indian lands were valued even higher. The proposed ten cents per acre was unacceptable. Lastly, the agreement lacked sufficient assistance for education of the children. Congress never considered Little Shell’s protest. It was not until December of 1882 that Congress designated a 24 by 32-mile tract in Rolette County as the Turtle Mountain Reservation for the Turtle Mountain Band of Chippewa. The government thought they were dealing with about 200 full-blooded Chippewas, but there were more than 1,000 mixed-bloods that they had not counted. The government wanted to allot the members 160 acres as they had done for the non-Indians in the area. However, the Chippewas were against this arrangement and preferred to hold the land in common with all tribal members. In 1882, President Chester Arthur established the Turtle Mountain Reservation with 22 townships of land. By March of 1884, the original 22 townships were reduced to two townships. All of the best farm land was now open to the public domain. In all that country west from the Red River, the railroad truly was the pioneer, blazing the way and furnishing the conveyance for colonizing the land. That country never was in any true sense a “covered wagon” country, but was settled from the immigrant train drawn by the locomotive. In 1887, the General Allotment Act, commonly referred as “the Dawes Act,” was passed by Congress. They named it for the chairperson of the Senate Committee on Indian Affairs, Henry L. Dawes. The government believed the Dawes Act to be a final solution to the “Indian problem.” “Congress was convinced that the allotment of land to tribal members would do the following: (1) destroy tribalism and reservations by individualizing Indians on allotments, (2) confer citizenship on all Indians, and (3) educate Indian youth to assure continuation of reforms. . .” (Prucha, 1975, pp. 171–174) The Act resulted in the allotment of lands to individual tribal members. 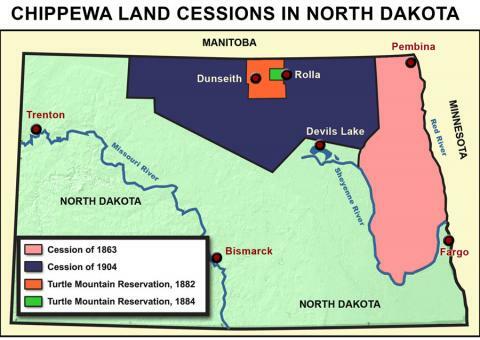 Since there were many more members than lands available, the government allotted lands to tribal members on the Turtle Mountain Reservation, at Trenton, North Dakota, in Montana, and elsewhere in the Dakotas. Throughout the late 1800s the Turtle Mountain Chippewa endured many hardships. The buffalo, a main source of food for the people, was now reaching extinction. The people throughout certain seasons would experience suffering and starvation. As early as the 1870s, poor conditions were reported in the Turtle Mountains. Not only had the food supply diminished, there was encroachment of white settlers. On June 25, 1882, a group of white settlers decided to settle in the Turtle Mountains near what is the present-day town of St. John. Under the leadership of Little Shell, 200 Indians rode over to the settlement and informed them they must leave their land. The settlers did move, however. Two of them were U.S. citizens who petitioned Washington to protect them from the Indians. On August 30, 1882, Major Conrad from Fort Totten traveled to the Turtle Mountains with more than forty soldiers. He met with Little Shell and told him that he would kill him if he harmed any of the white settlers. The settlers, after hearing the news from Conrad, moved back onto the reservation on September 3, 1882. In the mid 1880s, there were severe winter storms and summer droughts. This harsh weather caused many pioneer farms to fail in the Great Plains areas. The influx of Métis from Canada following the second Riel Rebellion caused an overcrowding of the two townships. These circumstances took their toll and in the winter of 1887–1888, and 151 members of the Turtle Mountain Band of Chippewa starved to death. 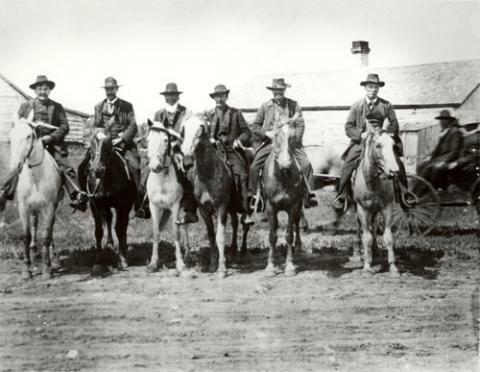 In 1889 some Turtle Mountain people were raising cattle received from the U.S. government. County officials tried to collect taxes on the cattle. The Chippewas refused to pay. When they refused, they took several head of cattle from them creating a hostile situation between the Chippewa and local officials. 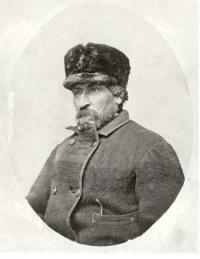 The Sheriff of Dunseith, Thomas Flynn, requested assistance from Major McKay of the National Guard. Major McKay and his 1st Battalion headed for the mountains. Because of the quick action of Mr. Salt and E.W. Brenner, they stopped the troop. They had received a telegram from Governor John Miller calling the troops back. The United States now dealt with Indians through the War Department. Considering the Indian as a military threat, Congress established an Indian agent system in 1896. Through this system, they assigned agents to different tribes whose responsibility it was to maintain friendships among the Indians, carry out treaty obligations, and mediate issues over land. They stationed agents, referred to as “Farmers in Charge,” at small posts in different regions of the country. The agent who served at Turtle Mountain was E. W. Brenner. He was headquartered at Fort Totten. In 1919, Indian men, who were not citizens, enlisted in large numbers in the World War I. Citizenship was granted to all Indian people with the passage of the Snyder Act in 1924. This piece of legislation became known as the Indian Citizenship Act and granted citizenship status to all Indian people, born within the territorial limits of the United States. The drought and Great Depression had a devastating impact on all of America. Accustomed to continuous poverty, struggle, and hunger, the impact on Turtle Mountain Chippewa was not as severely felt. Hardworking and resourceful people, the Chippewa adopted farming and gardening. Gardening was a means of maintaining a livelihood after the decline of their traditional occupations of hunting, trapping, and trading. They raised cattle, pigs, and fowl and supported themselves with limited hunting, trapping, and fishing. Through ingenuity, work was found in a variety of areas such as selling berries, trading and bartering, chopping and selling of wood, farm work, and even collecting medicinal herbs for pharmaceutical companies. Resources were limited and the people continued to struggle economically. It was under the administration of President Franklin D. Roosevelt that the Works Progress Administration (WPA) Act was passed in 1933. This program offered many economic options for the Turtle Mountain Band of Chippewa. Jobs were provided for men in road construction and home improvement on the reservation. Construction jobs entailed the building of small two- and three-room houses to replace one-room cabins. Women were given jobs and training in sewing, cooking, canning, and gardening. Some felt the depression was a blessing for tribal members because it opened up job opportunities through the WPA. Because of allotment and lack of employment opportunities, many Chippewa left the Turtle Mountain region. However, after the WPA program was off to a good start, people began to return. The Indian people in Rolette County numbered 2,400. Ten years later that number was up to 5,000. The work boosted the morale of the people and their standard of living. Most of the jobs provided were of a seasonal type, leaving a big part of the year in unemployment where hardship prevailed. Congress approved the first constitution of the Turtle Mountain Band in 1932. All of the subsequent revisions made by the tribe were approved by the Department of Interior. The Wheeler-Howard Act, known as the Indian Reorganization Act (IRA) of 1934, was the attempt to undo the damage caused by the earlier allotment acts. The Act was envisioned by John Collier, who became Commissioner of Indian Affairs. This legislation allowed tribes the opportunity to draft their own constitutions and bylaws, to “reorganize” under the authority of IRA and devise their own system of governance. This legislation also provided funds to some tribes to help them in reorganizing. By a vote of the people, the Turtle Mountain Band of Chippewa chose not to accept the Indian Reorganization Act as its form of government. During this time, the Turtle Mountain people, through their resourcefulness, had established and maintained a comfortable community. In 1922, a large mercantile store was built. 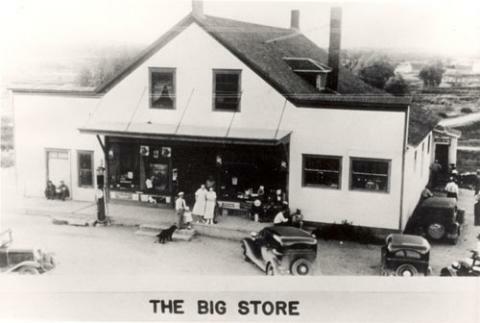 Known as “the Big Store,” this store, which was situated beside the lumber yard, served as a local gathering place. The town also supported a creamery, a grain elevator, a privately owned gas station, and a lumber yard. The people, returning to the reservation following the depression, required new opportunities. It was during this time that a hospital was built to accommodate the needs of the people. Congress established the U.S. Court of Claims in 1948. This legislation allowed the Turtle Mountain Band of Chippewa to file a claim against the government for unfair market value of lands ceded under the McCumber Agreement. The Chippewa pursued this claim from 1892 to 1975. For nearly a century, Chippewa people gathered, discussed, and journeyed to Washington, D.C. to gain redress. The payment of expenses and countless years of time came from the hearts of the Pembina descendants. The relocation program was established by the Bureau of Indian Affairs in 1952. This program encouraged relocating Indians to urban areas in search of employment. The program offered vocational training, travel monies, moving expenses, one year of medical care, and assistance in finding employment. By the 1960s, 2,900 Chippewa had moved away from the reservation. People were moving to California, Illinois, Washington, and other urban areas. Many Chippewa, who moved away at one time or another, returned. This rate of relocation continued until President John Kennedy’s “War on Poverty.” Many Chippewa, who took advantage of the relocation program, continued to return as the economy of the country fluctuated and urban communities decayed. The longing for family and cultural ties also drew them home. In 1954, Congress attempted to end the reservation system. Two men in particular, Arthur Walkings and E. Y. Berry, served on Indian Affairs committees. Congressman Walkings proposed the mainstreaming and assimilation of tribal people, thus freeing the federal government from its constitutionally-bound trust responsibility to tribal nations. Before the passage of this bill, Congress undertook three studies. These studies swayed Congress away from federal policies supported by the government under the “Reorganization Act.” This shift in federal policy openly encouraged termination. One report, the Zimmerman Report, proposed a four-part formula which assessed and ranked the tribes in terms of their relative level of economic readiness. They determined that ten (10) tribes were ready for termination. The Turtle Mountain Band was one of the names on the list of ten tribes to be terminated. By 1954, Congress made it known to tribes that they were holding hearings concerning their termination. The Turtle Mountain Band raised funds locally to send a delegation to Washington. Tribal Chairperson Patrick Gourneau testified that the Turtle Mountain people were unprepared economically, still living in poverty, and that such a move would be devastating. Following the testimony of the Turtle Mountain group, the subcommittee decided that the Turtle Mountain Band was not economically self-sufficient, and was dropped from the list. Perhaps because the Turtle Mountain people have always been resourceful, Congress made a preliminary determination, based upon the BIA Superintendents’ reports, to terminate the Band. They did not consider the fact that the Chippewa were still poverty stricken, occupied an extremely limited land base, and suffered from low education levels and high unemployment. Poverty was, and still remains, a concern for the Turtle Mountain people. In 1955 Dr. David Delorme described the socioeconomic conditions at Turtle Mountain as a “rural slum.” Economic deprivation created poverty conditions requiring rectification. President Kennedy addressed many concerns involving civil rights and social reform. Even though Kennedy was assassinated in 1963, his successor, Lyndon B. Johnson, used his influence to put Kennedy’s reform into action. Several efforts under the Johnson Administration provided new opportunity for Tribes. Congress passed laws forbidding racial discrimination. The President, in 1964, declared a “War on Poverty” and the “Great Society” reform was implemented. The Economic Opportunity Act of 1965 opened the door to “self-determination.” The Economic Opportunity Act directed financial aid into the hands of tribal governments. Prior to this, monies were filtered through the Bureau of Indian Affairs. Now, for the first time, Tribal governments would handle their own budgeted monies. The limited powers of Tribal councils were increased and supported by the passage of the Indian Civil Rights Act of 1968. This legislation affirmed the rights of Tribal Nations and extended some provisions of the Bill of Rights to Indian people that had been afforded to all American citizens. The idea of self determination was first addressed by President Lyndon Johnson in an address to Congress. Indian leaders advocated for a change from termination to self control, which meant, at some future point, tribes would assume control over their own affairs without bureaucratic interference. This did not mean the federal government would have less responsibility to tribes or end their federal trust relationship. President Richard Nixon continued to support Indian self-determination. In 1975, Congress passed the Indian Self-determination and Education Assistance Act. This public law formally recognized the right of autonomy of tribal nations as a national Indian policy. Growing awareness that more college-educated tribal people were needed to provide necessary and effective services on the Turtle Mountain Chippewa Reservation led to efforts in the 1960s to bring college courses to the reservation. Efforts by local Indian citizens resulted in a charter from the Tribe to establish the Turtle Mountain Community College (TMCC) in 1972. In September of 1976, the college received a Certificate of Incorporation from the State of North Dakota. The founding mission of the college was to provide higher education services for tribal members, preserve and promote the history and culture of the Turtle Mountain Band of Chippewa, and provide leadership and community service to the reservation. TMCC offers Associate of Arts, Associate of Science, Associate of Applied Science, and Vocational Certificate programs. In 1978, the Tribal Controlled College Assistance Act was significant in that it provided the financial support required to implement the Tribe’s higher educational goals. Land grant status was granted to the institution in 1994. Another achievement occurred in 1996 when President Bill Clinton signed the Executive Order directing that all federal agencies support tribal controlled colleges. Turtle Mountain Community College is fully accredited. The college became a candidate for accreditation in 1980, and received full accreditation from the North Central Association of Colleges and Schools (NCA) in 1984. In 2003, TMCC was recommended by a visiting team from the Higher Learning Commission of the NCA for 10 more years of accreditation. In 2007, more than 650 students were enrolled at Turtle Mountain Community College. To date more than 1,000 tribal members have graduated from the institution. Approximately 300 of them have gone on to earn bachelors and advanced degrees. While the reservation experiences high unemployment, the graduates of Turtle Mountain Community College experience a much lower unemployment rate. In the spring of 1997, a ground-breaking ceremony was held and work began on a new, $10 million facility designed to serve 800 students. Those who attended witnessed what many have called sacred messages…there were some special things happening around the sun, and an eagle floated above during the ceremony. In 1980, the U.S. Court of Claims awarded a judgment to the Pembina Band of Chippewa for $52.5 million stemming from the McCumber Agreement. This payment (dockets numbered 113, 191, 221, and 246), was payment for more than 8 million acres of land in north central North Dakota. The ninety-seventh Congress of the United States passed an act known as Public law 97-403 in December of 1982. The Act provided for the use and distribution of funds awarded to five Pembina Indian Bands. Awardees included the Turtle Mountain Band of Chippewa, Rocky Boy Chippewa-Cree of Montana, White Earth Pembina Band of the Minnesota Chippewa, Little Shell Band of Chippewa (Montana), and various Pembina descendants. Congress appropriated funds to the Bureau of Indian Affairs whose responsibility it was to certify eligibility and distribution of funds. The Bureau distributed 80 percent of the funds to eligible members and held 20 percent in trust for the benefit of the Turtle Mountain Band. The Act directed the Secretary of the Interior to authorize the Tribal Council to use the interest and investment income accrued from the 20 percent set-aside for economic development. The McCumber Agreement Award (for the Ten Cent Treaty) was invested by the BIA Branch of Investments. In a period of eight years the invested money grew to more than $102 million. Payment to the Turtle Mountain Band of Chippewa came through the distribution of three treaty checks. In 1984, members whose names appeared on the 1940 base roll, from the Old Crossing Treaty, received the first payment of about $43.81. They issued a partial payment on June 16, 1988, for $1,721.50, and a final payment on February 1994 of approximately $1,200. Tribal members of one-fourth or more degree of Indian blood and born on or before December 31, 1982 and enrolled before December 30, 1983 were entitled to share in the claim as an enrolled member. Minors, entitled to the treaty payment, have monies held in trust until their 18th birthday. The Bureau completed total distribution to this group in 2000. Around the early 1800s, the supply of food and game on the plains had grown scarce. As a result, the seasonal hunting of the Chippewa expanded westward in search of game. This took them into the confluence area of the Yellowstone and Missouri Rivers, a major crossing point of many other Indian tribes that hunted and traded through the territory. Fort Union, which the American Fur Company had established around 1828, controlled most of the Northwest trade. Around 1867, after the fur trade had declined, they abandoned Fort Union. Fort Buford was established in 1866, at the juncture of the two rivers. It served as a supply headquarters for military campaigns against the Sioux. Many Indian people continued to hunt and trap around the area. In 1886, following the implementation of the General Allotment Act, there was not sufficient land available on the Turtle Mountain Reservation for allotments for all tribal members. Many had continued their migratory hunting patterns into western North Dakota and Montana. The Dawes Commission, finding more Turtle Mountain tribal members than there was land, allotted nearly 6,698 acres in western North Dakota, in Williams County, to tribal members. During this time, many Turtle Mountain Chippewa, who had hunted in the Williams County area took their allotments, and moved to the Fort Buford area. Fort Buford was disbanded on October 21, 1895. Having settled and prospered on their allotments, the Turtle Mountain people continued to live in the area. As the railroad industry declined, the Turtle Mountain people migrated to other areas in search of work. Many never returned to the Fort Buford area. During the early part of the 1900s, a group of Turtle Mountain Chippewa continued to live in the area. During the 1930s, many found work in government-sponsored programs, and worked on various development projects, including the Buford-Trenton Irrigation district. They maintained their ties with the Turtle Mountain Band, but received no assistance from them. When crude oil was discovered in the early 1950s near Tioga, North Dakota, the resulting oil boom again created a flourishing environment for communities such as Williston and Trenton. The Turtle Mountain Chippewa again experienced prosperity. As the young people grew up, some began to move to the Williston area. Because much of their work was greatly dependent upon the local economy, seasonal unemployment was a chronic concern. In the spring of 1972, the people of Williams County formed the Fort Buford Indian Development Corporation. The purpose was to qualify for several economic recovery programs, and to insure the future of the people. They established the corporation, and through it received several housing, health service, and employment programs. During the mid 1970s, many of the Chippewa were concerned with maintaining and preserving their identity as Turtle Mountain Chippewa and their connection to the heritage and culture. The Fort Buford Development Corporation sought designation as a formal extension of the Turtle Mountain Band. Designated as the “Trenton Indian Service Area” (TISA), it was established by Ordinance 28 of the Turtle Mountain Tribal Council on March 25, 1975. As a result, the people at Trenton formed their own governing structure. The Trenton Indian Service area lies in the northwest corner of North Dakota, and the northeast section of Montana. Much of the area is in Williams and Divide Counties, and the northern portion of McKenzie County. The area covers approximately 6, 200 square miles, is bounded on the north by the Canadian border and on the west by the Fort Peck Indian Reservation in Montana. Trenton, the center of operation for TISA, is located 14 miles southwest of Williston, North Dakota. A board of directors governs the Trenton Indian Service Area, which consists of seven members, two from each of the three districts, and one chairperson. The chairperson is elected at-large. The enrolled members of the Trenton Indian Service Area elect the board members. The total service population of TISA is approximately 3,000; enrolled members number 2,600. Today, the Turtle Mountain Chippewas at Trenton celebrate Trenton Indian Service Area Days each July.